When civilization finally crumbles and society is no more, movie fans should be well prepared. After all, Hollywood has been offering up visions of a post-apocalyptic world for years. Bora Barroso, a film student from Madrid, has compiled some striking images from these movies into a dramatic montage called “The World Of Tomorrow (A Tribute).” That’s a friendly, optimistic title, but this is mostly pretty grim stuff. Gray skies, abandoned cities, rusted-out cars, and hopelessly barren landscapes are the order of the day here. Marauding bands of flesh-eating zombies and/or super-intelligent apes are optional but preferred. 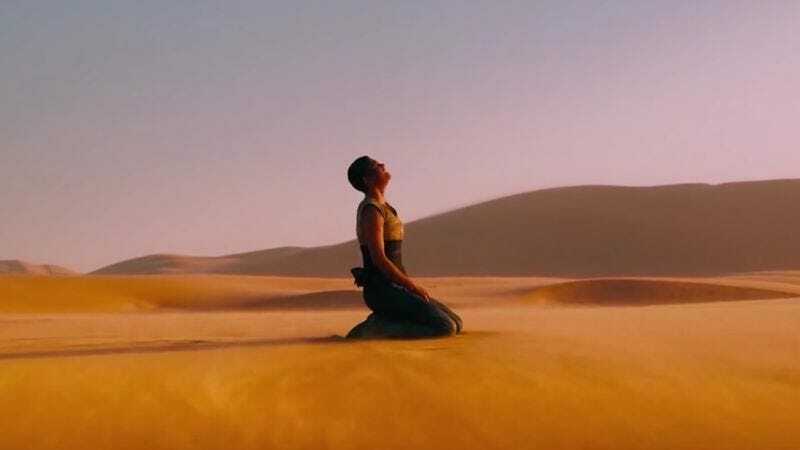 Mad Max: Fury Road, probably the most colorful and eccentric of the recent post-apocalyptic films, is cited here several times. But that acclaimed sequel hardly has a monopoly on humanity’s bleak future, as evidenced by clips from The Road, The Book Of Eli, Children Of Men, I Am Legend, and other discouraging titles. THE WORLD OF TOMORROW (A Tribute) from Bora Barroso on Vimeo. One thing’s for sure: The humans who manage to survive the upcoming cataclysm won’t be needing any sunscreen. The sun hardly ever shines in these movies. Cloudy, overcast skies are pretty much permanent. No one ever laughs. Crying jags are still common, though. Other popular activities include trudging across lifeless terrain while looking solemn yet determined. That seems to take up most of people’s time. While technology has largely vanished, it will still be very possible to blow things up in the future. There’s a whole passage in “The World Of Tomorrow” devoted to huge, fiery explosions. So at least we’ll have that to look forward to.